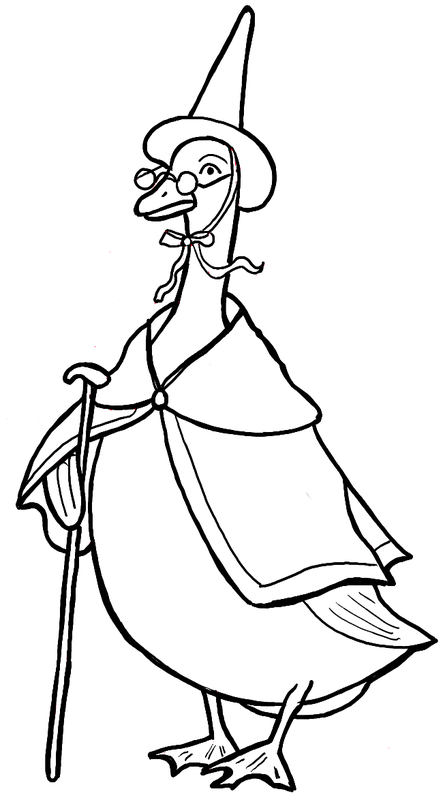 Learn how to draw Mother Goose with the following easy-to-follow, step by step instructions. 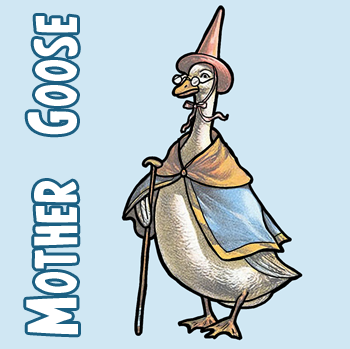 Mother Goose is all embedded in our childhood memories, it is sort of fun to draw such a beloved character. 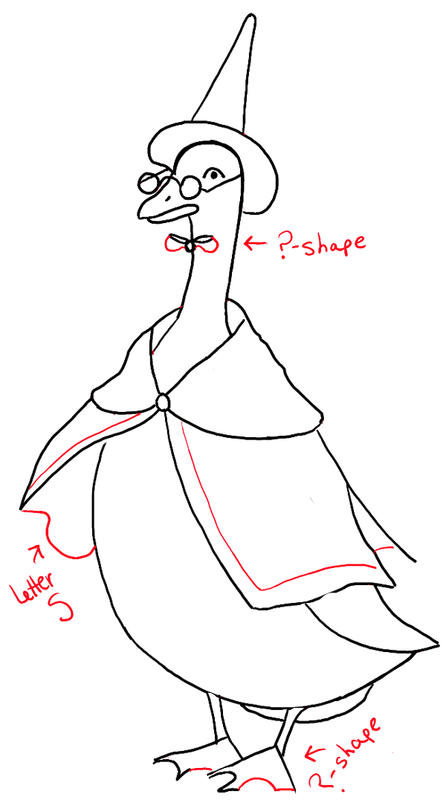 We will guide you thru the simple steps to drawing a beautiful Mother Goose. Have fun! 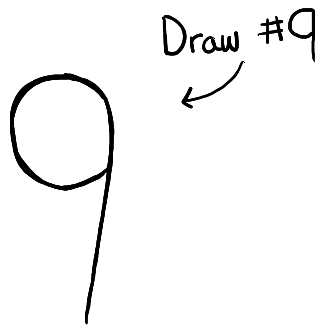 Start off by drawing a #9. 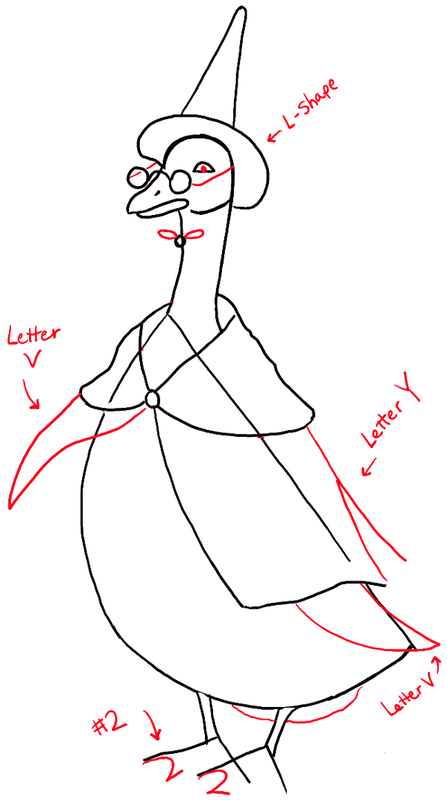 Draw letter ‘S’ shape for beak. 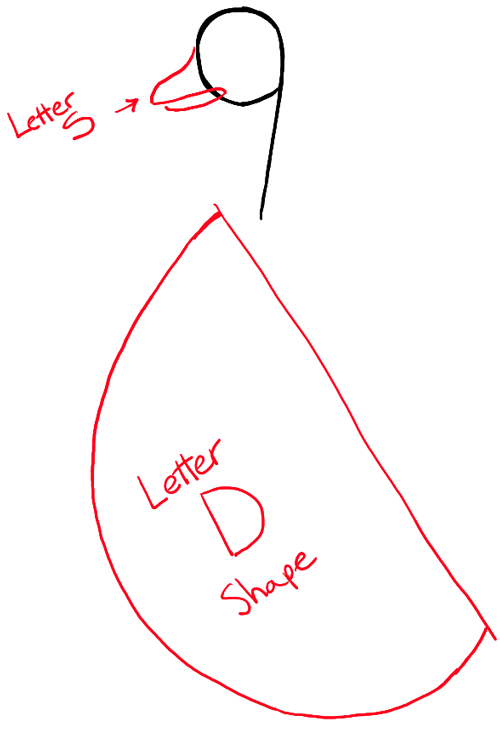 Draw letter ‘D’ shape for body. Draw sideways letter ‘D’ shape for bottom of hat. Draw 2 lines for each leg. 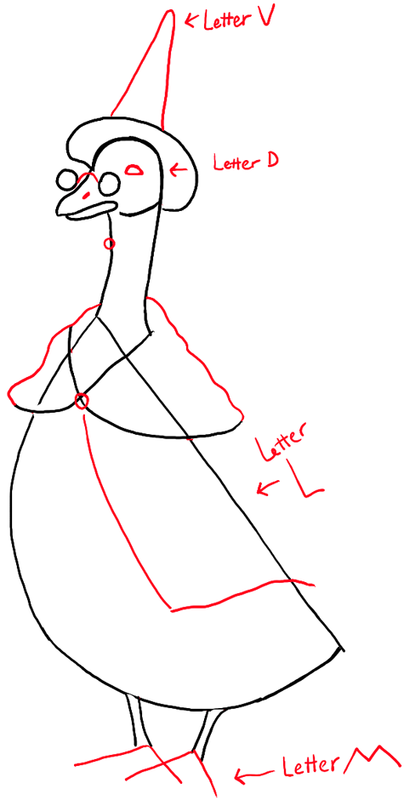 Draw 2 curved lines over chest, forming a letter ‘x’-like shape. Draw upside down letter ‘v’ shape for top of hat. Draw letter ‘v’ shapes for feet – forming a letter ‘m’ like shape. Draw a letter ‘D’ shape for the eye. Draw a curved line for center of glasses. Draw part of her shawl. Finish up glasses and eye. Draw a #2-like shape on each foot. Draw wings and bottom curve. Add a few other details. 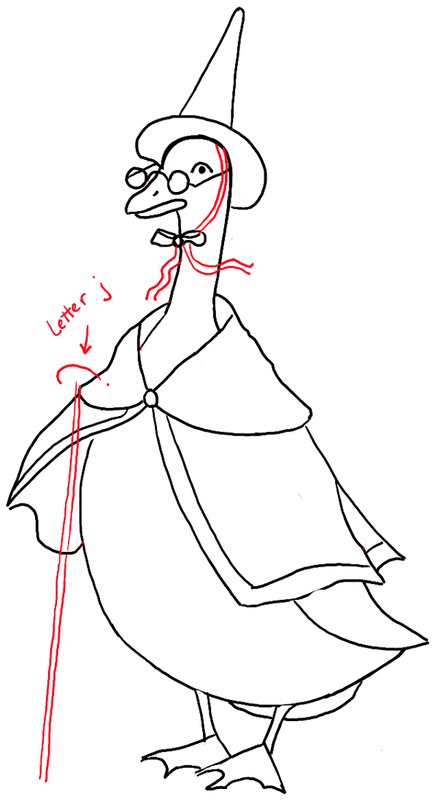 Draw letter ‘S’ shape on left wing. Draw eye brow and left wing holding walking stick. – Finish it all up. 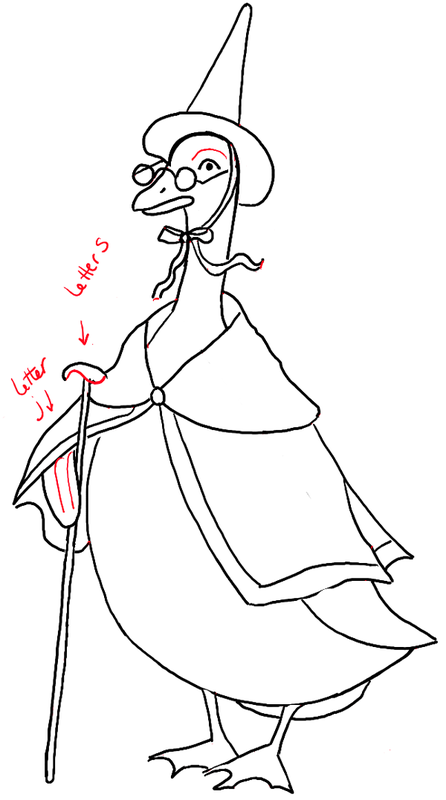 Erase any remaining guide lines and darken / thicken lines to make it look nice and crisp. 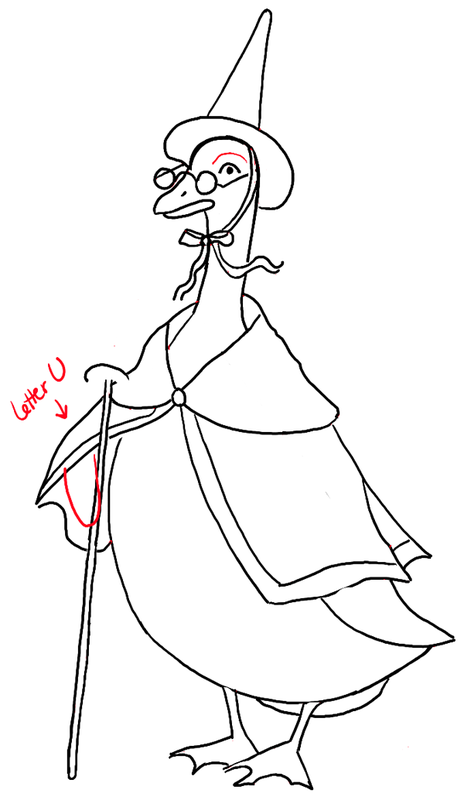 You can color in Mother Goose if you like. Come back soon for more drawing tutorials. This article was written on 09 Sep 2015, and is filled under Birds, Nursery Rhymes & Fairy Tales.